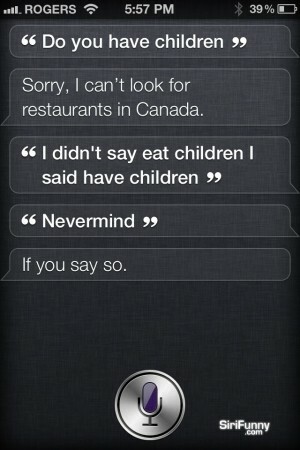 Siri Funny | Do you have children, Siri? I love you Siri, who’s your daddy? 4 Responses to Do you have children, Siri? I told Siri what’s the meaning of life and she said, “I Kant answer that. Ha ha. I asked Siri to tell me a story, but she kept on saying it was a dark and stormy night, wait that’s not it or I’m sure I’ve already told you, but after 27 she finally told me it.